It was the tweets that broke the news to me this morning before I'd even turned on the television. I realise this goes against the twitter grain, but I tend to gently wake up to Sky News in the morning and having seen that there'd been an earthquake from the few tweets that were coming in I turned on. The images that greeted me filled me with horror, as I'm sure they did many of you this morning. There's something about a Tsunami, mother nature at it's most potent and destructive. The fact that because of twitter I have friends living in Japan and Japanese friends living in the UK made the whole thing feel so much closer than it would have done just two years ago. Twitter for its all of its faults has done that. The chaos of those images we've all seen today of a wall of debris moving across rural land, taking homes, vehicles and doubtless hundreds of people with it will live with us all for a long long time. 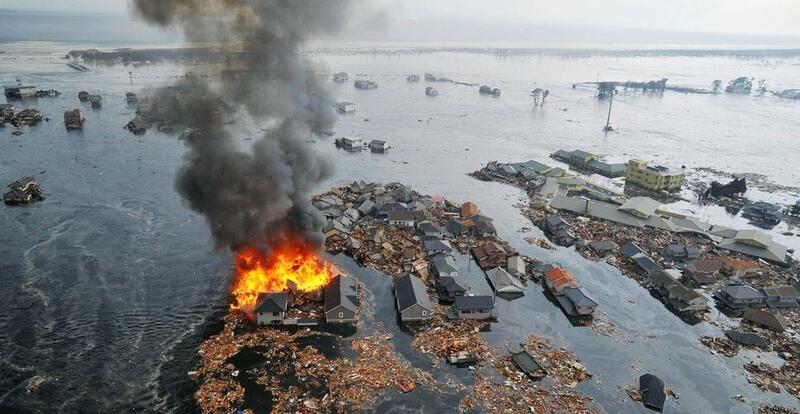 The horror of it, the aftermath to come, the panic of a man running down a country road to get away from the oncoming water, the gut wrenching fear so many have felt today in northern Japan will live with those caught up in it and lucky enough to survive today, forever. Think of them tonight as your sat in your warm comfortable house or flat and be thankful. TV images haven't shaken me up so much since "you know what"... Gutting.